One of my favourite cookbooks before I went vegan was “The Flavour of California” by Marlena Spieler. It’s a vegetarian book but quite a lot of the recipes are naturally vegan or quite easy to veganise. The book doesn’t seem to be available anymore so if you happen to see it anywhere for sale I’d grab it while you can. Like lots of my books I don’t look at it very often but flicking through it now there’s lots to make. One of my favourite ever soups is from this book and I make it reasonably often. It’s easy, hearty, comforting, totally perfect for a cold day and naturally vegan. I made the salsa from the book but if you’ve got any leftover salsa knocking around it’s even quicker. Put the barley, split peas, broth and cumin into a pan. 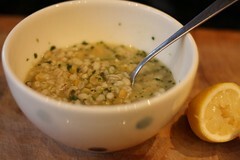 Bring to the boil, then reduce the heat, cover and simmer until the barley and split peas are tender, around 40 minutes. In a separate pan heat the garlic in the oil and then add to the split pea and barley mix, along with the salsa. Mix all together in a food processor/blender. I also wanted to remind everyone about the other blog I co-write with my friend Tami about www.crosscountrymovingcompanies.biz cheap cross country moving companies. We’re cooking our way through the 2 Horizons books. We started it for VeganMofo but we’re updating it sporadically. I’ve just written about my Christmas Eve starter and I have a fantastic Christmas Day breakfast to come in the next few days. If you make anything from either of those books let us know; we’d love to hear about it! This entry was posted in Flavor of California by efcliz. Bookmark the permalink. This sounds great. Thanks for posting the recipe! Split peas are my least favorite legume because they are so firm, and I like mine nearly mushy. Maybe I’d just need to cook them in a recipe like this a bit longer?